Pappada vada is a traditional Kerala evening snack food. 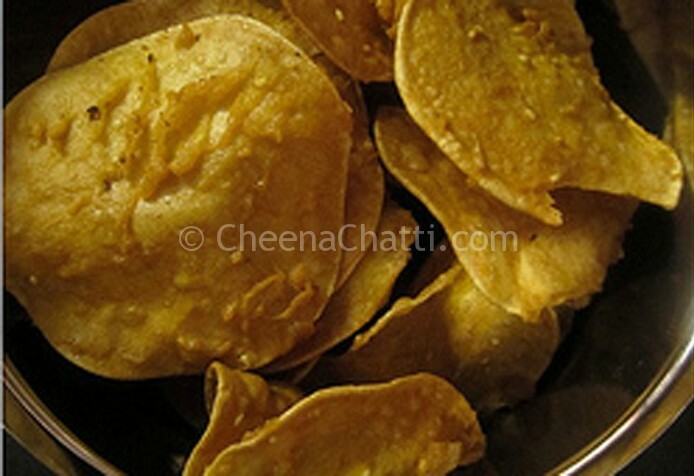 You will find this snack item in the local hotels or tea stalls through out Kerala. Its a tasty and easy to prepare one. Pappada vadas are prepared by deep frying the pappads (Kerala papadam) dipped in the rice batter. I remember those good old days, my grandfather used to bought this to home when he returns from the shop. I really miss those days. Love you grand pa..
Wash and clean the rice and soak it in water for 15-20 minutes. Drain out water and grind the soaked rice along with dry red chillies (or chilly powder) and turmeric powder into a smooth paste in a mixer adding enough water. Transfer it to a medium sized bowl and add salt, black sesame seeds, cumin seeds, a pinch of asafoetida and mix everything well together. In a deep bottomed frying pan, heat the coconut oil and reduce the heat to medium. Dip each pappads in rice batter (make sure pappads are well coated with the batter) one by one at a time and deep fry them till golden color on both the sides (1-3 pappads at a time depending upon the size of your pan). Drain on Kitchen tissues and serve hot with black tea or store in air tight containers. My mom dries the pappads in sun for about 15 to 30 minutes before the preparation. This will make the pappada vada more crispy. Need more vada recipes? Dont worry, try these. This entry was added on May 25th, 2013 by Cini P Moideen in Bakery and tagged with calories pappada vada, best pappada vada, pappada vada ingredients, easy pappada vada, cuisine pappada vada, indian pappada vada, taste pappada vada, nadan palaharam, vada. Last revised on April 4th, 2018. Recipe & Recipe photo contributed by Nanditha. പപ്പട വട ഉണ്ടാക്കി കഴിച്ചു…എല്ലാം സ്വന്തം പരീക്ഷണം..വിജയം.